The fourth and final round of the Christchurch Mx in the U.K. 2017 season took place on Sunday October 8th at Crow, near Ringwood, on a rough old school lay out that provided fast action packed races and a few new challengers emerging. Report by Mark Teggin – Images courtesy of Darren Miller (Looney Tunes Photography). In the Junior group it was Buddy Shipton who took some family tips on board with a brace of wins taking the overall honours in first place, followed by the new 2017 Junior champion crowned on the day Glen Phillips in second place after a solid end to his season. In third place was Louis Parker who battled all day with Fourth placed man Gra Ing, Dale Abley placed fifth overall and rounding out the top six was Tom Barfoot. In the senior group it was Thomas Shutler who made the rest of the pack green with envy as he powered his Kawasaki to top spot taking first overall. In second place was Jack carpenter who took a race win to his name too. Third and fourth place saw club championship rivals James Cole and Luke Dewey fill the spots as Dale Lyons secured fifth and Toby Frampton rounded out the top six on the day. The Experts headed to Crow with the biggest line up to date with British stars aplenty old and new in the hunt for overall glory, the overall on the day honours going to the ever rapid Jake Shipton who gave the rest of the pack a clean set of heals taking first place. Runner up and showing some great speed was Lewis Barfoot as he stayed upright this time at Crow! Third place was the youngster Josh Bunter who battled off fourth placed Scott Newham. In fifth place proving that the speed never goes and was still as stylish as he was back in the glory days was Mervyn Anstie a week after son Max dominated the Motocross of nations, and rounding out the top six was Jack Sherwin. 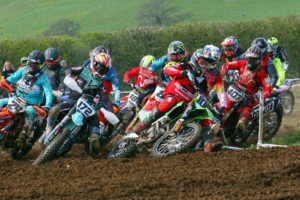 The open two stroke group saw Jamie Skuse take the overall honours in first place on the M.D/Maunders racing Yamaha, followed home by Jordan Carter in second place. In third place was Olly Jones who showed he’s just at home on a two stroke as he is a four stroke. Ryan Zebedee powered his Husqvarna 150 to Fourth on the day followed home by premix debutant Jake Parker in fifth. Phil Lewis proved Evo power is still good enough to run with the youngsters as he rounded out the top six with sixth overall. In the battle of the Twinshocks it was the man who seems to get faster as he gets older, Terry House who powered his Maico to the overall first place honours followed home in second by Sam Pocock and rounding out the Twinshock top three was Stephen Miller. Graham Challis was ever present throughout the day to take fourth overall battling with Mike Popperwell who took fifth overall and Dom Durkan who was ever consistent throughout the season ended up round out the top six in sixth place. The over 45 group saw the Twinshock group winner Terry House add another first place overall to his day honours as he made the New 2017 Over 45’s Championship winner Stephen Elford claim runner up in second place on the day. Nicky Abbott rolled back the years and took his Evo powered Honda on to the day podium in third battling with his back in the day nemesis Dave Shipton as he ended the day in fourth overall. Christchurch Mx’s very own Shaun Hayles powered the two stroke Yamaha to fifth as runner up in the championship Tom Lowe ended the day in sixth overall. The Partridge British Pre 83 125cc class joined us at Crow and the podium consisted of Paul Baldwin who took the overall honours in first place, finishing ahead of runner up Warren Berthaume and rounding out the top three in third place overall was Robert Jones. Rounding off the day was the Four Stroke Twinshock group podium of first placed man Paul Webb who powered his old school machine to victory taking first place overall. In second place was Matt Fry and rounding out the top three finishing in third overall was Martin Kemp. Christchurch MXC bowing out with big finale at Crow!